You are here: Home / Kentucky / Happy 4th of July! The 4th of July – Independence Day – is the National Day of the United States of America. 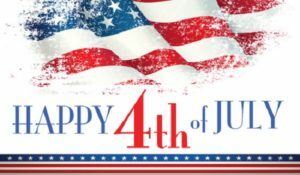 It is commonly celebrated with fireworks, parades, carnivals, fairs, picnics, concerts, games, reunions, or political speeches and ceremonies celebrating the history, government and traditions of the United States. It was 242 years ago that the Continental Congress declared that the 13 American colonies regarded themselves as a new nation, the United States of America, and were no longer part of the British Empire. On that day, the Congress marked the occasion by commemorating the adoption of the Declaration of Independence. In speaking of the Declaration being approved, John Adams wrote to his wife, Abigail that the document would: “be the most memorable epoch in the history of America. I am apt to believe that it will be celebrated by succeeding generations as the great anniversary festival. It ought to be commemorated as the day of deliverance, by solemn acts of devotion to God Almighty. It ought to be solemnized with pomp and parade, with shows, games, sports, guns, bells, bonfires, and illuminations, from one end of this continent to the other, from this time forward forever more.” Dismas Charities agrees with our distinguished Founding Father and thanks him for his courage.